To the Calotype: Happy 175th Birthday! Please join me in imagining that these are candles on the birthday cake. It was in the days prior to this week in 1840 that Henry Talbot made the tremendous breakthrough that propelled his negative/positive photography into the wider public arena. Within the stream of his continuing research, it was during a few days in September that a eureka moment hit him. He discovered the secrets of the calotype negative process. Having conceived of the idea of photography in 1833, Talbot consciously set out in the spring of 1834 to invent such a beast. That he did, calling his first successes sciagraphs (objects depicted through their shadows) for they were now what we call negatives. Light affected the sensitive silver salts that he coated on his paper, darkening those areas of the subject where there was the most light and leaving the paper relatively unaffected where the subject was dim. By the time he announced photography to the public in January 1839, Talbot had changed the name to photogenic drawing. I rather like both of these early names, but as Sir John Herschel was to point out, the alternative term of photography proved to be much more flexible. Talbot’s discovery of the calotype was certainly not essential to his personal photography, for the above lovely Wheel &c was made by him in February 1840, long before his discovery of the new process. 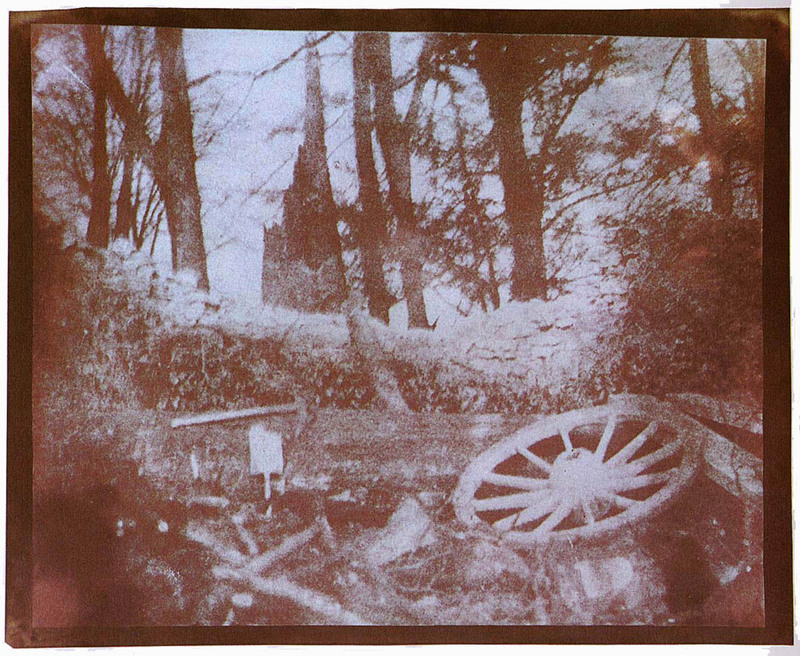 It is one of many examples of fully accomplished photographs using photogenic drawing paper to make the negative in the camera. This sensitised paper belongs to the class of what are called print-out papers. There is no developer involved, for the tiny clusters of silver that form the visible image are reduced from their halide form solely by the action of light. The most familiar example of this is what we now call the salt print or salted paper print; this is nothing more than Talbot’s original photogenic drawing paper. The surviving camera negative for the above is about 2/3 the size of a regular sheet of paper, a very practical dimension for a contact print. Its print was made on a chemically identical sheet of paper; in fact, had he wanted to, Talbot could have torn a sheet of sensitised paper in half, using one section for the negative, reserving the other for later to make the print. This is a photogenic drawing print (salt print) from a photogenic drawing negative. Relying strictly on solar energy to produce contact prints was not a practical problem, for even in often dreary English weather a print could be exposed in a reasonable time. For use in the camera, however, depending on the brightness of the sun and the speed of the lens, asking the sun to do all the heavy lifting could lead to a frustratingly long affair. In order to maximize the use of existing light, Talbot’s first negatives in 1834 and 1835 were restricted to the tiny ‘mousetrap’ cameras shown in a previous blog. Even so, exposure times were half an hour or more. By the spring of 1840 he had refined the photogenic drawing process to the point where a much larger negative like the above had become practical. But as he recorded on the negative, this particular one took a thirty minute exposure. Some of the resulting softness might be attributed to camera movement during this period, some to the effects of wind on the subject, and some to the fact that the earth turns and the sunlight and shadows were constantly rearranging themselves. As the year 1840 progressed, Henry Talbot was a very happy man. He had been badly battered by the events of 1839, but the bright weather of 1840 and the rapid advancement of both his technique and his vision had led to a very satisfying portfolio. The public was starting to notice. The year before, in 1839, his experimental Notebook P filled the month of September 1839 with musings on the Daguerreotype, mention of Nicéphore Niépce, notice of Herschel’s new process of making negatives on glass, spectral experiments, electricity, and especially a number of ventures into the possibility of producing photographic images in printer’s ink. He even jotted down a note about “New Art”, “Nature’s Pencil, No. 1” with a partial quote from Virgil that he would later expand for the title page for The Pencil of Nature. A year later, in September 1840 in Notebook Q, his observations ranged through electricity and magnetism, internal combustion engines, atmospheric railways and some new types of photographic papers, including the virtually unknown Leuctotype positive process and Waterloo paper. On 20 September something odd grabbed his attention. Talbot got progressively more and more excited on 21 and 22 September and by 23 September “some very remarkable results were obtained. Half a minute suffices for the Camera the paper when removed is often perfectly blank but when kept in the dark the picture begins to appear spontaneously and keeps improving for several minutes….” Talbot had discovered how to exploit a latent image, subsequently greatly amplified by chemical development, to reduce his exposure times dramatically. The magic ingredient, gallic acid, had an effect so extraordinary to Talbot that he physically cut the word out of his notebook page, lest it prematurely fall into the wrong hands. This process would become known as the Calotype (his mother and some friends would have preferred him to call it the Talbotype, but Henry always resisted this) and was really only applicable to negatives. The ‘calotype’ prints that we normally see are actually photogenic drawing prints made from a calotype negative. Instead of relying on solar energy to reduce the light sensitive silver halides to metallic silver, the calotype instead captured the effects of an invisible latent image. An alteration in the chemical surface had occurred during a very short period of exposure. This was amplified hundreds or thousands of times by the action of the gallic acid developer. 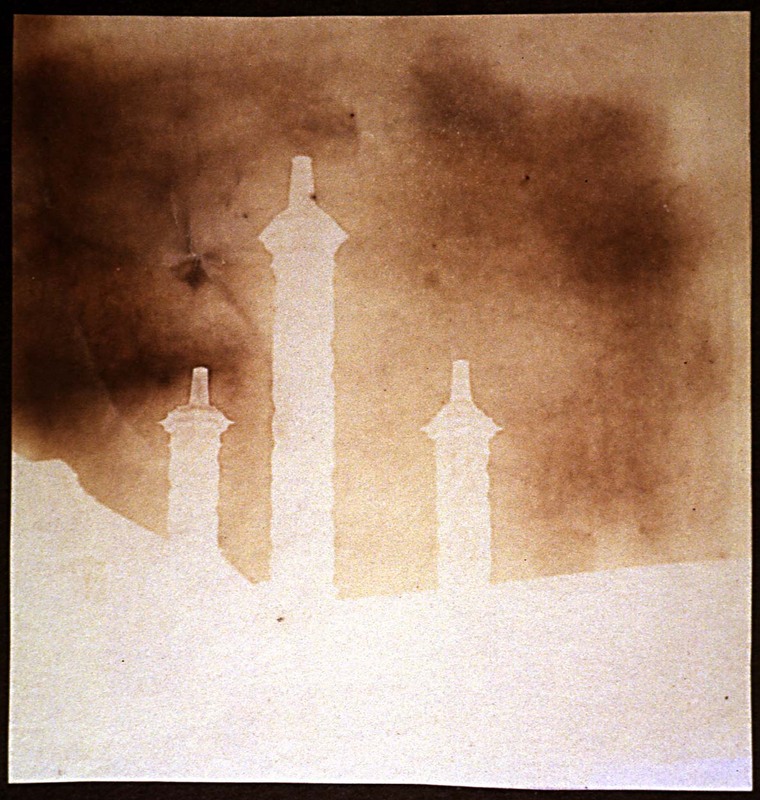 One can barely imagine Talbot’s excitement when he took today’s lead photograph, “Three Chimnies (Large)” on 7 October 1840. He had imposed an artificial set of conditions on this image that would have raised impossible barriers for photogenic drawing paper. In order to get sufficient depth of field (sharpness) he used the smallest aperture of his lens, greatly restricting the light that passed through, and then waited for the “evening sun”, presumably at dusk. Even so, he was successful with this negative with a three minute exposure. In brighter daylight his camera exposure times dropped into seconds. The new negative process expanded his repertoire and enabled him to take increasingly sophisticated photographs under all sorts of conditions. 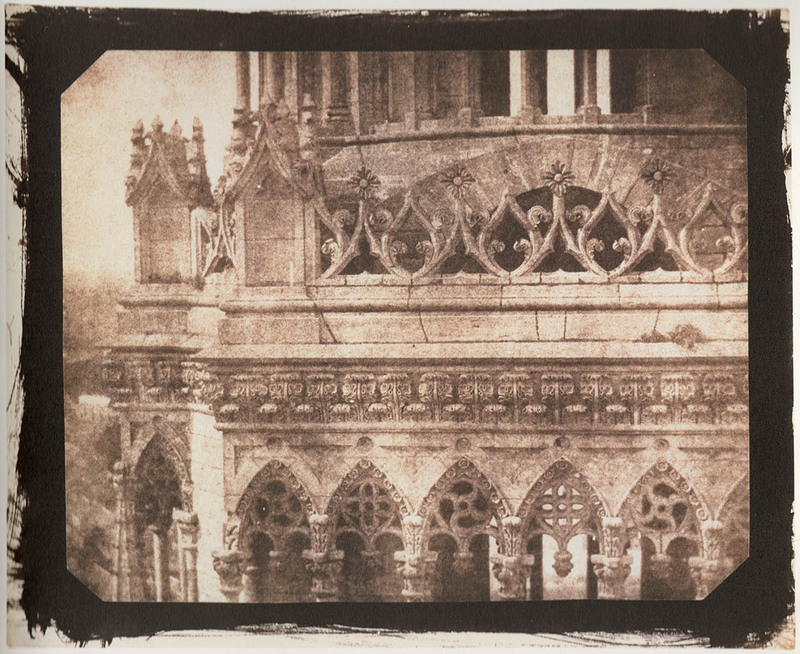 A fine example is this study of the details of one of the towers of Orleans Cathedral taken in the summer of 1843. Although the Cathedral itself was ancient, the stonework had recently been replaced and even at these giddy heights, undoubtedly with a good wind blowing, the calotype was up to the task of recording the intricate detail. The daguerreotype also employed a latent image, although the extent to which this was understood by anybody at the time is unclear. Daguerre first revealed his manipulatory details in August 1839 and ironically Talbot was put in the uncomfortable position of having to explain the French process to the British Association for the Advancement of Science meeting later that month. Talbot informed the members that “M. Daguerre has disclosed the remarkable fact, that this feeble impression can be increased, brought out, and strengthened, at a subsequent time, by exposing the plate to the vapour of mercury.” While no Talbot daguerreotypes have been positively identified, he obtained three of the outfits and was certainly practising the process by the end of 1839. It doesn’t appear that Talbot, or for that matter Daguerre or anyone else at the time realised that the latent image was also essential to shortening the exposure time in the metal plate process – they simply saw it as a stage in the process. At the beginning of March 1840, Talbot obtained a copy of Daguerre’s newly-released British patent, sent to him by his attorneys in London. In the subsequent published version of British Patent No. 8194, Daguerre at one stage observed that “nothing is visible” on the plate in the camera and in the next stage that “after several minutes of time have elapsed that faint tracings of the objects begin to appear.” There appears to be no significance attached to this. 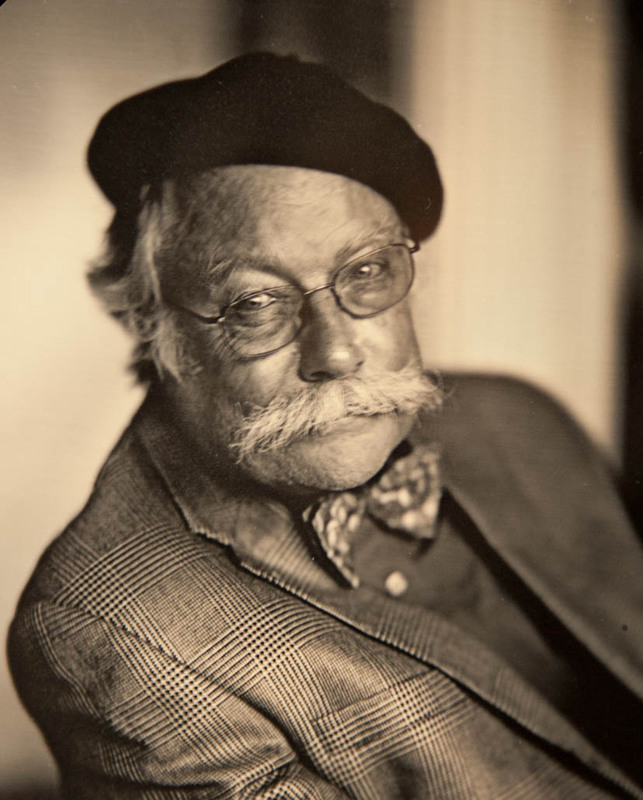 Lest we undervalue Talbot’s original process of photogenic drawing, it is my opinion that if he had first invented the calotype – the developed negative – he most likely would not have evolved as quickly or as dramatically as a photographic artist. The immediately visible camera negative of photogenic drawing was a necessary stage in his artistic development. Right on the spot, he could look at the scene and compare how Nature had rendered it on paper. But contemplation of that must be left to a future blog. • Questions or Comments? Please contact Prof Schaaf directly at larry.schaaf@bodleian.ox.ac.uk • WHFT, Three Chimnies (Large), calotype negative, 7 October 1840, Photographic History Collection, Smithsonian’s National Museum of American History, 1995.206.109; Schaaf 2495. • WHFT, Wheel &c, salt print from a photogenic drawing negative, 24 February 1840, National Media Museum, Bradford, 1937-366/94; Schaaf 2347. 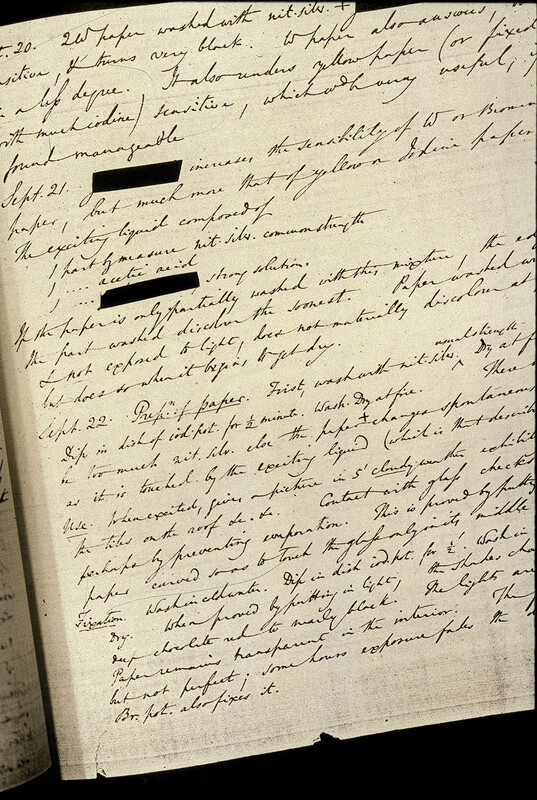 • WHFT, Notebook Q, page from the section for 20 September 1840, National Media Museum, Bradford; facsimile reproductions and annotated inscriptions of Talbot’s most essential research notebooks are reproduced in my Records of the Dawn of Photography: Talbot’s Notebooks P & Q (Cambridge: Cambridge University Press, 1996). • WHFT, One of the Towers of Orleans Cathedral, as Seen from the Opposite Tower, salt print from a calotype negative, 21 June 1843, Joy of Giving Something, Inc., New York; Schaaf 2728. • Herschel to Talbot, 16 March 1841, Talbot Correspondence Document no. 04213. • WHFT’s comments to the BAAS were reported in The Athenæum, no. 618, 31 Aug 1839, p 643. • On 29 February 1840, Poole & Carpmael met Talbot’s request for a handwritten copy of Daguerre’s patent just a fortnight after it had been filed: Doc. no. 04048.